As the ongoing mystery of Malaysia Airlines Flight 370 continues, information is coming out hard and fast. Not only did a Malaysian official say that the route taken by the Boeing 777 points to hijacking, but now, it may have flown over China for hours. Where the plane might be now, either intact or in pieces, is what investigators are looking for. Part of the search hinges on satellite "pings" that were sent from the plane to a satellite owned by Boeing, that was part of an available option that Malaysia Airlines chose not to buy into. Did Malaysia Air Opt Out Of Real-Time Data Monitoring From Boeing? Basically, what the option would do is send flight information, such as location, back to the satellite so that the flight could be monitored. Since the airline didn't take up the option, the necessary software wasn't installed on the plane. But because the hardware was there as standard, the plane was still sending automatic pings to the satellite every hour. Furthermore, whoever was flying the plane, if someone was actually flying the plane, seemed to have moved it in a zig-zag pattern along existing flight routes, which would have been done to arouse the least amount of suspicion on radar. Here's where the information gets tricky. 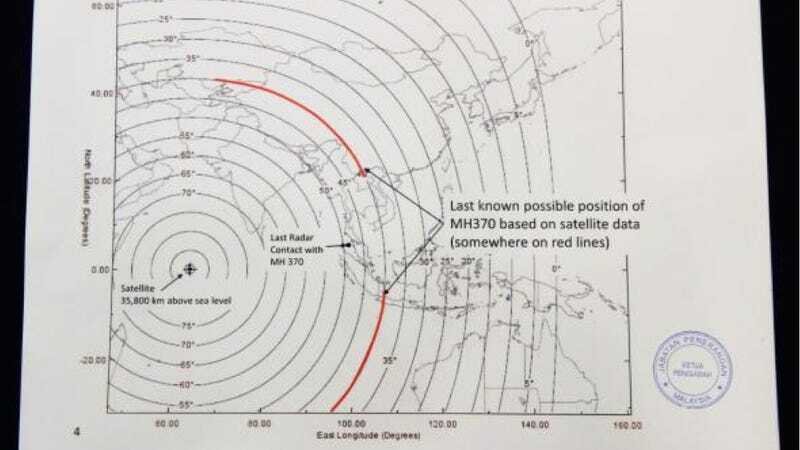 The satellite was able to determine that the plane was traveling along one of two arcs, highlighted in red in the picture above provided by the Malaysian government. One of the arcs spans far out into the Indian Ocean, where there's not much of anything, and a strong likelihood that the plane eventually crashed into the water. International media first started reporting the plane was missing once its transponder turned off, meaning that when the investigation started, the plane could have still been in the air. As the video above points out, it's possible (though unlikely), that someone could also have cut the device sending out the ping to the satellite. Which means the plane could've flown even further than what current maps are suggesting. And while the scenario of the plane still being intact is unlikely, it's theoretically possible that a Boeing 777, low on fuel, could land on something as simple as a hard-packed dirt airstrip that's only a little over 3,000 feet. And there's still the mystery of the passengers, and what you'd do with so large of a plane and so many people. But now, there's an even bigger problem of geopolitics than everything we've already got, which is basically trying to get the Malaysians, the Indonesians, the Vietnamese, the Burmese, the Chinese, the Thais, and the Indians all to work together to find one plane. And that's what happened to the plane if it did indeed fly over land. Because if it did, it would have almost certainly been picked up on radar by a few of those countries, not least of which is the Chinese. And if the Chinese did pick it up, where is it now? And if not, why not? All of this is hopeful speculation, of course, mixed with a bit of what's come out so far. Because a world in which these people are still alive, somewhere, anywhere, is a much better world than one in which they aren't. UPDATE: American investigators are now saying that the plane more likely traveled to some point along the southern arc, according to Bloomberg, contradicting their Malaysian counterparts. We'll update you with more information as it comes in.